A book that will shake your core both spiritually and emotionally. 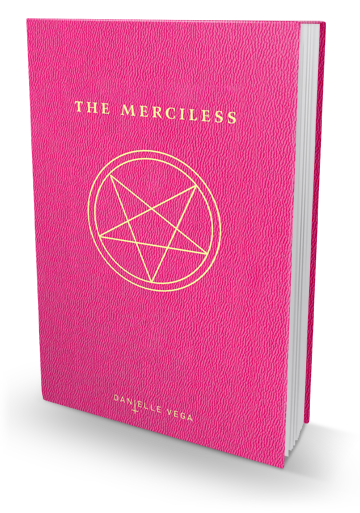 The Merciless by Danielle Vega has been on my list since the very first time I laid my eyes on it. Cover wise is very simple yet it will give you the curiosity of why was it covered with an inverted pentagram on a pink background. This is especially for people who love anything associated with horror and spookiness. I, myself is a huge fan of creepy books which is why The Merciless caught my attention and I can tell you, it did not disappoint me. The story revolves around Sofia Flores who herself has things going on in her life. She mirrors that usual high school life, being alone in a new environment, bullies, weird things, and cannot fit in. Most of us can surely relate to this kind of scenario. A pretty face in the crowd of the unknown lies a story that you either want to hear or not at all. This book reminded me of couple of horror movies I have seen. The first book reminded me of Jennifer's body and Cabin in the Woods. The gore and horror are well balanced that you wanted to find out more about it as you read. It twists your mind with who is who and which is which. It got me reading the book in half day because I just cannot stop reading at all. The Merciless shows someone's deepest desires and ugliness. It shows how a person can be so bad with their intentions. It gives the impression of not all good are good and not all bad are bad. Some good things turn out to be bad and vice versa. It shows that people can sometimes unconsciously bring the bad out of them and manifest it on others leaving them completely satisfied to see a person suffer. Don't we all get satisfied when someone we hate so much got punished by something or someone? Well, this mirrors that trait perfectly. No matter how hard Sofia tried to tell herself that she doesn't want to hurt anybody but deep inside her, she gets satisfied to see someone pay for what they have done. That is her demon. We all have demons inside of us. It could be jealousy, pride, lust, greed, etc. The Merciless talks about the seven deadly sins in a way that we can mirror ourselves even with just the smallest details or intention we have for somebody. It also discusses how someone can be deceived or us simply to deceive others. Friends can be enemies and enemies can also be our friends but the nature won't come easy unless something triggers it to come out. The Merciless truly doesn't have any mercy. I love how it goes from Mean Girls to a total psycho creep. I am giving the book 4.8 out of 5 rating since I think that there could be a little more spice to it. There are some scenes that are a little bit predictable but it's inevitable simply because an idea comes from another idea improved by the author. If you are into something that's a little bit creepier than the usual then this book is for you. Thank you guys so much for reading my review of The Merciless I, as I am guest posting here on Home of a Book Lover. I am Czyrah or you can also call me Aizy, check out my social media account @aizystyle on instagram and my very own blog, The Penguin Talk (thepgt.blogspot.com). I will also be reviewing the two other books so stay tuned. I recommend reading the The Merciless so you guys can experience the ups and downs of the book, you never know, you might discover your demons too.